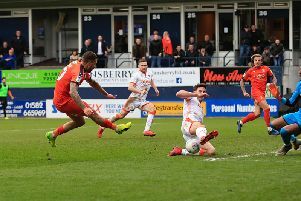 Hatters boss Mick Harford is hopeful that defender Dan Potts won’t be out for too long after going off injured during Saturday’s 4-0 win over Doncaster Rovers. The left back was making his first league start since the 2-0 win victory against Walsall on October 20, but last just 23 minutes, jarring his knee after falling awkwardly when going up for an aerial challenge. Harford said: “He’s twisted his knee, we don’t know the extent of the injury, we’ll let it settle down over the weekend and probably have a scan on Monday. Potts had been in the side for Luke Berry, with James Justin moving up into midfield, and when asked why he made the change, Harford said: “My thoughts were, we were a really, really attack-minded team in terms of who we’re playing, how we play. “We had three strikers and I just think we needed another defender in the central areas. “JJ started the game very well, we’re disappointed that Pottsy got injured, but I’ve got to be honest with you, Luke Berry came on and he was magnificent. Berry himself had been disappointed not to make the starting 11, but made sure he was ready to come on whenever asked this time after that hadn’t been the case Bradford earlier in the month. He added: “He’s (Potts) a quick healer, so hopefully he’ll be back soon. “Obviously I want to be playing every game, but the manager made his decision, I had to respect that and if I came on, like I did, had to make an impact.